Digging restarted Tuesday morning for the Highway 99 tunnel, six weeks after a sinkhole and tipped barge caused the state to suspend the work. Digging restarted Tuesday at the Highway 99 tunnel, six weeks after a sinkhole and tipped barge prompted the state to suspend the work. The state’s review committee of independent experts approved a plan by contractors to improve how soil is monitored, as it flows through the giant cutting face and out the rear of the tunnel-boring machine. The suspension is being “conditionally lifted” for 160 feet, enough space for Seattle Tunnel Partners (STP) to lay 25 more of the 6½-foot rings that form the walls of the four-lane tube. Bertha has moved 1,283 feet (including 3 feet as of 3 p.m. Tuesday) on its 9,270-foot trip. The old timeline: Bertha was originally supposed to finish digging in late 2014 and the tunnel open to traffic by Dec. 31, 2015. The new timeline: Last fall, contractors estimated the tunnel opening in April 2018, a date that could be delayed further. Tunnel-boring machine Bertha pushed ahead 3 feet Tuesday, between 10:40 a.m. and 3 p.m., said Todd Trepanier, program administrator for the Washington State Department of Transportation (WSDOT). The top of the drill is about 60 feet below street level, along the waterfront near South Washington Street. Gov. Jay Inslee said the state was right to suspend digging Jan. 14 for safety’s sake. 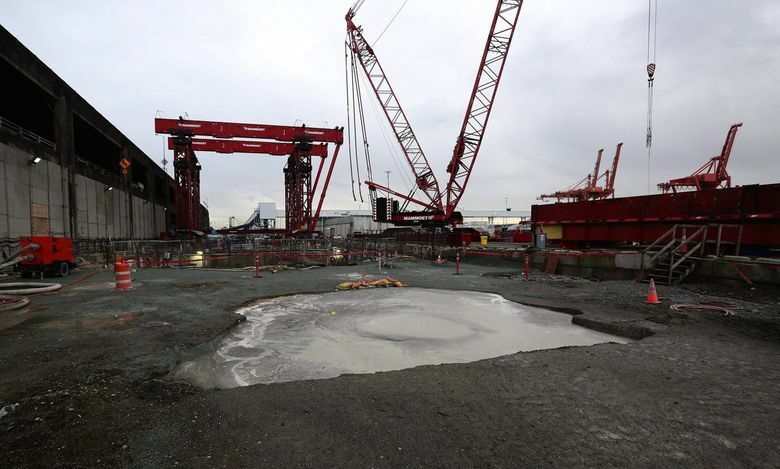 The public understands tunnel builders need to prove they won’t create sinkholes before Bertha reaches the Alaskan Way Viaduct and downtown, he said. “I think it’s fair to say this contractor has a new machine, they’ve got new management, and they’ve got a new quality-control system,” Inslee said. But the contractors continue to believe the suspension was “wrongful and unjustified” and intend to bill the state for millions of dollars in delays, STP project manager Chris Dixon said Tuesday evening. The sinkhole occurred in a place where STP had built a wall of buried concrete pillars to protect the viaduct, which “worked exactly as we intended,” he said. “It had no effect on the viaduct. It created no public-safety issue. There was no worker-safety issue, because we covered the area with red tape and backfilled the sinkhole,” he said. WSDOT offered no estimate Tuesday about how long it should take to drill the next 160 feet. Meetings will be held at that juncture. If all goes well, the machine will be permitted to continue 100 feet north, to a concrete-lined maintenance stop at Yesler Way, Trepanier said. Barring further problems, Bertha may proceed under the viaduct and downtown sometime this spring. Problems have afflicted the project since boring began July 30, 2013. The tunnel was supposed to open to traffic in December 2015, a date that’s been pushed out to spring 2018. But Bertha’s front end suffered major damage and spent last year being strengthened by manufacturer Hitachi Zosen, at a cost of tens of millions of dollars. The rejuvenated drill busted out of its repair-access vault in early January, but then the sinkhole of 250 cubic yards formed near the cutter Jan. 12. Inslee, acting on advice from WSDOT, announced two days later that tunneling would be suspended until STP, led by Dragados USA and Tutor-Perini of California, demonstrated how it would improve performance. Spanish-based Dragados is transferring four veteran tunnel managers to the Seattle job site, and three are to stay beyond the 160-foot trial period. “We have a significantly improved team. I think it’s like changing the quarterback, or at least the tight ends,” Inslee said Tuesday. Contractors don’t plan to stiffen the soil ahead of Bertha by injecting grout, or by ground freezing as in the nearby seawall replacement. That would be unnecessary, said Dixon, since the machine is descending into stronger soil — and any vertical grouting would disturb the archaeologically sensitive area known as Ballast Island, where Native Duwamish families gathered, and ships dumped materials. Sinkholes and voids occur on tunnel projects, but Highway 99 is especially tricky because mistakes could damage the viaduct and downtown buildings. Crews must ensure the rate of soil removal matches the volume of the advancing drill face. “The object is to tunnel in a way that the earth doesn’t know you’re there,” Trepanier said. STP remains barred from loading barges, and will remove dirt using trucks at Terminal 46. The companies are still writing a safety manual, to prevent dangerous shifting of soil on a barge, Dixon said. The contract is worth $1.35 billion, but builders have filed more than $200 million in potential claims. STP has been paid $1 billion so far for work completed, including at the north and south portals. The state wouldn’t release the STP improvement plan Tuesday, saying a formal public-records request is required. Due to backlogs, these typically take four or five weeks to fulfill. Contractors filed 1,500 pages of documents, of which 60 pages contain tunneling or management plans, and the rest are appendices, Dixon said. Bertha performed well lately and should “definitely” complete the trip to South Lake Union, he said. The Hitachi Zosen tunnel machine, at 57 feet, 4 inches diameter, is the second largest in history, surpassed last year by a 57-foot, 9 inch machine built by German rival Herrenknecht, building a new mainland-to-airport highway tube in Hong Kong. Inslee said there is no “Plan B” to attempt some other viaduct replacement in the event Bertha fails.